I was born in Budapest, Hungary in 1941. Two years to the day after Germany invaded Poland. My home was about 5 blocks behind the Parliament buildings, the beautiful neogothic structure on the Danube, that you usually see on the news when Hungary is mentioned. I was a very observant child, who soaked up all that was happening around me. During the 50's I was a student in public school. I observed and experienced the repressive post-war communist regime that culminated in the Hungarian revolution in October 1956. My mother and I escaped in the night trudging across plowed fields. Suddenly my world was turned upside down and found myself as a refugee in Austria, then 4 months later, shivering at the corner of Portage and Main in Winnipeg. Learning English, adjusting to a new lifestyle and making friends with other young adults who were brought up in a stable, naive, yet in some ways more sophisticated, affluent western environment was no small feat. With a lot of help and understanding from friends and teachers, I successfully finished high school and earned a degree in Science at the University of Manitoba in 1963. Shortly after graduation I met and married another refugee, John Kende, a cartographer. His career-moves had us living in Toronto, Winnipeg, Edmonton and Calgary. 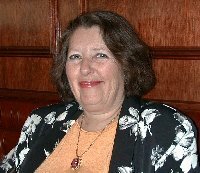 For 20 years I worked as a biochemist, research assistant in medicine at various universities and hospitals across Canada. Although my jobs exposed me to computers very early, writing a 324 page book and teaching myself to compose an EBook was a challenge. Our son Leslie was born in Winnipeg in 1968. He is an engineer, a graduate of Queen's University. He and his wife Ruth a registered nurse live in Calgary. On December 22, 1998 they presented us with a beautiful grandson Noah Thomas. We are "semi-retired" in Canmore Alberta in the Canadian Rocky Mountains. Our home is on the edge of an environmental reserve, near the Bow River. We have frequent visits from coyotes, bears, elk and deer in our back yard and there is a constant traffic around our bird feeders. This is a Pileated Woodpecker. I garden, knit, crochet, tole paint, read, volunteer and of course, cook up a storm. We travel to Hungary, exotic places like China, Cuba and Jamaica, as well as, around Canada as frequently as possible. I love to visit the market in Budapest with its huge array of attractively displayed produce. 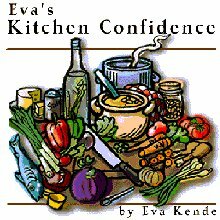 Now that I have "launched" Eva's Kitchen Confidence, I am hoping to "make time " to write some anecdotes about growing up under communist rule, people, being a refugee in a strange land, my travel experiences and anything else that stirs my emotions.